French football team LOSC Lille has responded to an Olympique Lyonnais fan’s sexist poster by offering all women supporters free entry to their next home game. 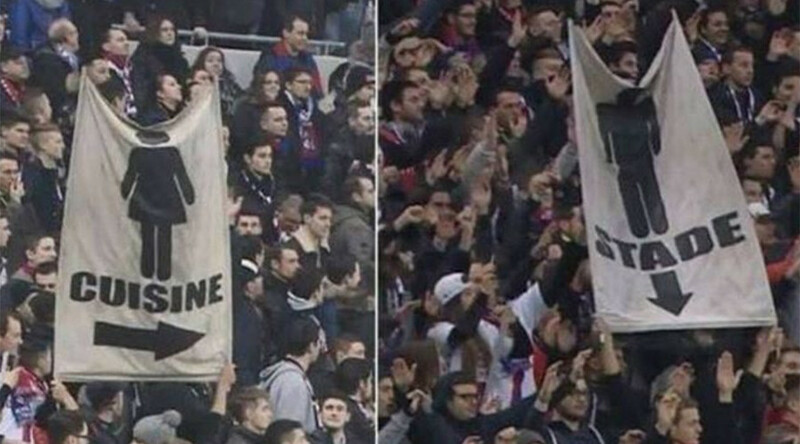 During the Ligue 1 match between the two on Saturday, a Lyon supporter displayed the side of the misogynistic banner that showed an arrow directing women to the kitchen - “cuisine” in French - for the first half of the game at the Parc Olympique Lyonnais, nicknamed "Grande Stade." The supporter then turned the anti-feminist flag around to show where they think men belong: in the stadium - "stade" in French. Lille claimed a 2-1 away victory on the day with two goals from Yassine Benzia. After the match, the club chose to respond to the sexist statement by offering each female supporter free entry into their forthcoming league fixture against Lorient. “Ladies, with us you are welcome,” an official club tweet read, posted on Tuesday. Wendie Renard, captain of Lyon’s female team, 14-time champions of France, took to Twitter to demand an explanation from the fan and from Jean-Michel Aulas, the Lyon president. Aulas insisted the club had already begun taking action in response to the incident. "The club will crack down and will lodge a complaint against the bearer of this banner," he said. “He was removed and then identified and reported by an individual."